There are a few things to consider when selecting a shiny wallpaper for your home décor, such as natural light, type of room, and overall style. 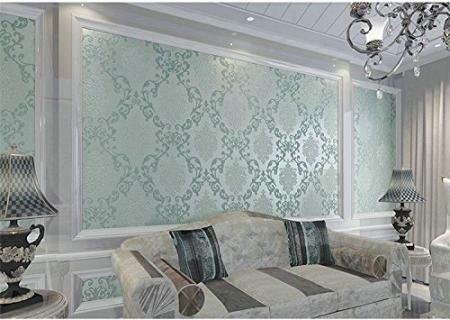 Some wallpapers can be used on every wall while others are better used for dramatic accent wall. If your room has a lot of natural light, selecting a shiny wallpaper may not be your best choice. Keep in mind that the main point of using metallic, foil, or other shiny wallpaper is to bring more light into your décor. To accomplish this, shiny wallpaper is reflective. In a room bombarded with sunlight, the reflective wallpaper may be distracting or even harsh. You must decide if having the shiny wallpaper is worth compromising the natural light. If you decide to go with the wallpaper, then you can use blinds, sheers and/or draperies to control the amount of sunlight. The next question to answer is how many walls in the room do you plan on covering? Many rooms will look great with all walls covered, while some rooms are more conducive to using wallpaper on one wall. Windowless rooms benefit highly from shiny wallpapers. A metallic, foil, or other shiny wallpaper will greatly magnify the artificial light and help to give the illusion of a larger space. You can cover all the walls in these rooms for the maximum benefit of the reflective surface. 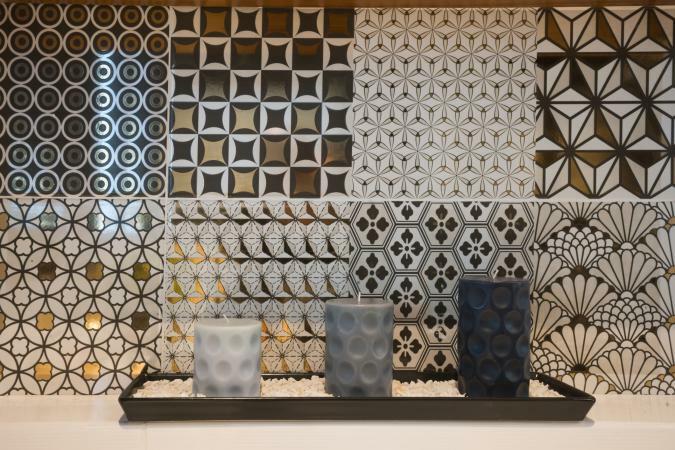 Make the most of an accent wall with a dark-colored wallpaper that features a foil or metallic pattern. This stark contrast can instantly transform a mediocre room design. 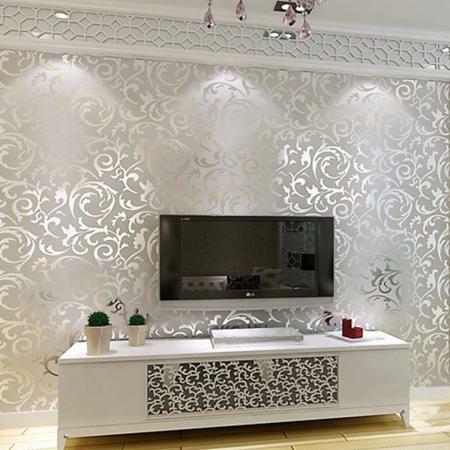 Solid walls, ones without any windows or doors, make the best accent walls for using a foil wallpaper. A sophisticated living room design will become a statement when you add a shiny wallpaper. Spruce up a bedroom with a stunning foil wallpaper on the wall behind the bed. A small kitchen breakfast nook can look expansive with the right metallic pattern and color(s). You can create a truly glamorous spa retreat when you renovate with a shiny wallpaper. Don't be afraid of colors and large patterns. You can go as dramatic as you want with a dark or bright color. Be bold and create a unique bathroom design that is sophisticated and expensive looking. Small bathrooms visually expand when a large foil or metallic wallpaper is added. Go with darker colors to give the illusion of a bigger space and add a dramatic flair. Freshen up a partially tiled wall with a shiny wallpaper. 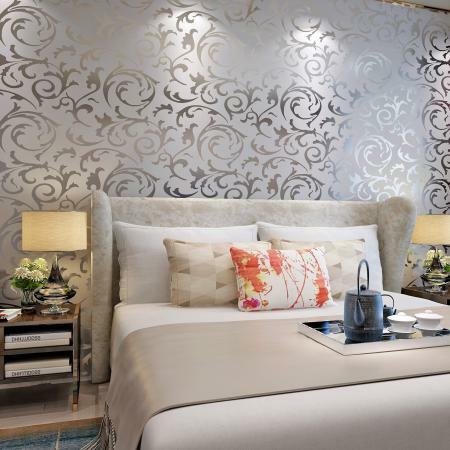 If your heart's desire is a stunning, glamorous bedroom, then go for a silver damask foil with a colored background. Another chic look is a color on color, such as gold foil on a gold background or a colored metallic design. Glam boutique dressing room: A silver and pink foil wallpaper highlighted by mini-crystal chandeliers will complete a plush, chic dressing area. Modern dining room: Select a metallic geometric pattern wall mural for a stunning effect. Home office: An elegant choice is a textured damask in a soft ecru featuring gold foil leaves. Contemporary living room: Choose a faded matte-finished background with a metallic floral design. Industrial loft: A corrugated metallic design will accentuate this style of décor. There are countless wallpaper choices that ensure you can find one that will go with your décor. For the small investment of a few rolls of wallpaper, you can completely transform any room.